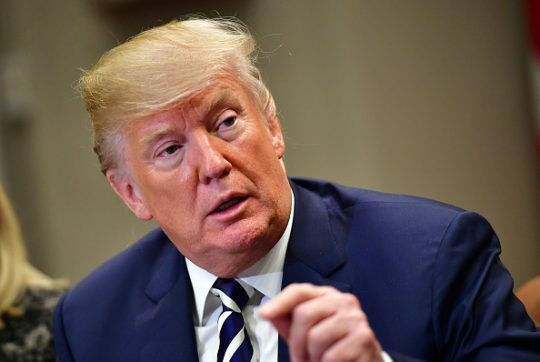 The White House said President Donald Trump was "disappointed" in the defeat of the House Republican farm bill on Friday after the conservative Freedom Caucus torpedoed the legislation. After a failure to reach an agreement over an immigration bill, 30 Republicans joined all the chamber's Democrats to vote down the law 198-213 in what Politico called "a huge setback to the farm lobby and House Speaker Paul Ryan's welfare reform agenda." Trump said through a spokeswoman he hoped the House could resolve its issues to "achieve strong work requirements and support our Nation's agricultural community." "President Donald J. Trump is disappointed in the result of today’s vote in the House of Representatives on the Farm bill, and hopes the House can resolve any remaining issues in order to achieve strong work requirements and support our Nation’s agricultural community," White House Deputy Press Secretary Lindsay Walters said in a statement. "The Administration underscores the need to bring certainty to our farmers and ranchers and to the many Americans receiving food assistance, and will continue to work with Congress to pass a Farm bill on time." Trump had tweeted his support for the bill on Thursday, saying "we must support our Nation's great farmers!" The House Freedom Caucus blocked the measure to put pressure on fellow lawmakers to vote on immigration legislation, according to Politico. "It’s not a fatal blow, it’s just a reorganize," said Freedom Caucus leader Mark Meadows. "I think at this point we just really need to deal with immigration in an effective way." Democrats opposed the bill in large part because of its stricter work requirements to qualify for food stamps, NPR reported. The bill could still be brought up, potentially depending on whether Ryan and the rest of the party leadership can get the votes for an immigration bill supported by conservatives but likely opposed by GOP moderates. This entry was posted in Politics and tagged Donald Trump, Farm Bill, Food Stamps, Paul Ryan, White House. Bookmark the permalink.